Confused? Can't figure out if you're looking at men or women? 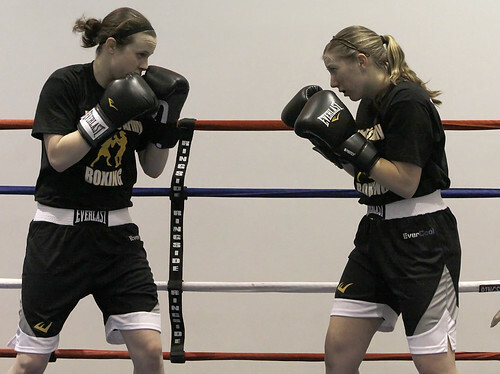 The Amateur International Boxing Association suspected as much, so they want to make it easier on you--by making women wear skirts during international competitions (you know, like the Olympics, where women's boxing may be featured for the first time in 2012). Their reasoning? It's too hard to tell female and male boxers apart. So far, the AIBA says that they are just trying it out and it's not mandatory, however, in an interview with Michael Rivest, the president of AIBA (Dr. Ching-Kuo Wu) said, "After we hear about its comfort and how easy it is to compete in the uniform, it may be compulsory." And it already is for boxers in Poland, who felt that the skirts were more "elegant" and "womanly." Right. Because boxing, a sport filled with blood, sweat, and repeatedly punching one another in the face is the perfect platform to dress up as a display of "elegance." That's not to say that boxing isn't womanly--indeed, I think that the women who excel at it show just how "womanly" it can be, but to expect women to perform as stereotypes while also performing as skilled athletes is insulting. As Rivest explains, "These are warriors, folks. AIBA may as well have handed them a mop." And if people really can't tell the men and women boxers apart (which I kind of doubt, but hey, it's not my argument), what's so bad about that? Aren't people watching them for the same reason: to see a skilled athletic performance? If you can't tell whether you're watching a man or a woman, doesn't that just prove that the athleticism is front and center, breaking down even gender stereotypes through hard work and agility?